Daniel Wahlen is a freelance filmmaker who loves to travel in search of the world's best stories. This is his blog, where he expresses ideas, shares his creative process, and invites further discussion about film. I had the opportunity to showcase some of the talented graduates coming out of Southern Adventist University this year. We sat them down to talk about their experience while attending Southern and got an incredible variety of stories: different majors, different backgrounds, yet all described their time at Southern as life-changing. I try to take each year as an opportunity to grow: learn a new skill, make friendships with creative and inspiring people, and expand my knowledge. Despite working in the film industry and loving movies, I grew up mainly reading books and only watching the occasional movie. Perhaps this is because when I was just 4 years old, my mom threw out our VHS copy of Disney’s animated masterpiece, Beauty and the Beast. (I watched it every day, sometimes twice a day, so I suppose she can be forgiven). Now, I felt the urge to exponentially grow my mental movie database. This year I decided to watch 100 movies I had never seen before. I tried to vary the selection as much as possible, while also keeping the quality of selections at a very high level. There are dramas, comedies, mysteries, quirky romances, biopics and documentaries, blockbusters and indies, black and white classics and visual spectacles. The oldest film I watched was released in 1934 and the newest came out in theaters the final week of 2015. Out of the 100 films I watched this year, I found 37 of them to be truly excellent and worth a recommendation. That’s not to say I didn’t enjoy many of the other films, but these were the standouts in my opinion. These selections have an image from the film as well as a short blurb with my thoughts. If you’re looking for some good films to watch, hopefully something here catches your eye. Each film title is linked to their respective IMDB page. Happy New Year, and here’s to many great films to come! Brie Larson gives a terrific performance as a staff member of a residential center for kids with troubled family lives. It gets especially interesting once she has to deal with her own issues while simultaneously trying to help the children she works with. The writing is incredibly natural, the storytelling is authentic, and the message resonates. One of the best films I've seen all year. This film encapsulates the magic of childhood and the bittersweet nature of growing up and losing innocence. Shot in beautifully scenic Oregon, the film features some of the best child performances I've seen. The final line sums it all up: "I never had any friends later on like the ones I had when I was twelve; does anyone?" Prior to this year, I had only seen Woody Allen's recent films Midnight In Paris and Blue Jasmine, both of which I very much enjoyed. Annie Hall turned out to be my favorite of the three. It's always interesting to watch classic films and be able to see their influence over many of my newer favorites. Annie Hall has it all: witty dialogue, subtle and self-deprecating humor, surrealist moments, and philosophical insights. Believe it or not, this was my introduction to Quentin Tarantino. And what an introduction it was! Great writing, clever story structure, and interesting characters had me immediately enthralled. Kill Bill is really one story split into two films, but I liked the second volume a bit better. The film is styled after a spaghetti western, with great, methodic pacing and big standoffs leading into climactic duels. It's a saga about revenge, but my favorite part was how Tarantino handled the finale. It contrasts brilliantly with the numerous monumental fight scenes preceding it and leans more towards being a battle of wits. This was one of the most surprising films I saw this year, as I came in with very low expectations but I thought it was genuinely very funny! I watched it again with my wife the following weekend, and I enjoyed it just as much. The writing is stellar—self aware, referential and meta humor, along with lots of visual gags that don't let up until the credits roll. Jonah Hill and Channing Tatum have hilarious chemistry, and there is a great surprise cameo near the end, a la Zombieland. Dave Franco, Ice Cube, and Brie Larson, who is in three movies on this list, also give great performances. This was my first Marilyn Monroe movie, and it was very good! It follows two musicians who accidentally witness a mob murder and flee as undercover performers in an all female traveling band. Surprisingly the humor doesn't feel dated, and the plot twists will keep you guessing. I was quite simply blown away by this film. It truly is an epic and a masterpiece. The scale is enormous, with incredible set pieces and gorgeous cinematography. I couldn't believe this film came out 76 years ago! The central character is both fascinating and exceedingly frustrating. The famous line, "Frankly, my dear, I don't give a damn" is one of the most cathartic moments I've felt in a long time from a film. An absolutely riveting documentary, this film focuses on the preparation and execution of artist Philippe Petit's daring plan: to infiltrate New York City's World Trade Center and perform an incredible high-walk between the twin towers. This is the sort of film that needs no fictional retelling: it is utterly engaging and inspiring. Submarine is a great coming-of-age story that follows a 15 year-old boy who tries to lose his virginity before his next birthday, while at the same time attempting to fix his parents' failing marriage by interfering in his mother's flirtatious exploits with an ex-lover. Wonderfully shot, acted, and directed, the vision is unique and at times as squirm-inducing as our own muddled teenage memories. A splendid film that earns its surprisingly emotional finish. This was one of the most disturbing and powerful documentaries that I've seen. The film is a great introduction to the more alarming aspects of the cult of Scientology. It raises important questions that deal with faith of all forms and humanity's strong desire to be part of a community. This film blew me away. It's one of those movies I wanted to watch again immediately as soon as the credits began to roll. I even added the soundtrack to my vinyl collection. The film is best experienced knowing as little as possible. It's about a man who has been kidnapped and imprisoned for 15 years, and upon release has only 5 days to find out who imprisoned him and why before something terrible happens. This is the ultimate one-room film. It is set during a jury deliberation session for a murder trial. All but one juror is ready to sentence the man guilty, and through the course of the film we explore ideas about death, innocence, truth, personal biases, and responsibility. Despite the constrained location, the film maintains a brisk pace that keeps the viewer involved and piecing together information right along with the characters. I believe an engaging film comes down to great writing, and this is some of the best. Frances Ha has an incredibly natural, almost cinema verité aesthetic. The dialog was jarringly naturalistic, but once I become accustomed to the world, it was a cinematic experience I had never had before. The choice to shoot in black and white was an interesting one, and the cinematography certainly shines in the film. The characters were messy and authentic, and the film seems to be a loose commentary on the zeitgeist of the millennial generation. Now that I've seen the rest of Tarantino's filmography, I believe this to be his best work. The film is incredibly tight, with multiple strong characters and storylines converging for an incredible climax. Christoph Waltz won an Oscar for his excellent performance as the villainous Col. Hans Landa. The dialogue is superb and the tension palpable throughout. The opening scene plays like a short film: deliberate and chilling. All the pieces come together here to make an excellent, throroughly rewatchable film. Django Unchained is another Tarantino revenge flick, but this time instead of Jews vs. Nazis it's an escaped slave vs. the Antebellum South. Christoph Waltz is back, this time as a bounty hunter. He rescues Django from a slave trader, and the film follows their escapades as Django tries to rescue his wife from one of the most notorious plantation owners in the South, played by Leonardo DiCaprio. The scope of the film is quite large, especially for a Tarantino film, but the characters keep the narrative focused and engaging. Many people consider the third act to be the film's fatal flaw but I see it as the turning point for Django's character as we see him finally become the master of his own destiny. Ex Machina is science fiction done right. The film is high concept, poses intriguing philosophical questions dealing with human nature and science, and has stunningly beautiful imagery. The cast is exceedingly minimal, allowing Oscar Isaac, Domnhall Gleeson, and Alicia Vikander a chance to truly shine. This is the directorial debut of novelist and screenwriter Alex Garland, who also wrote the screenplay for Sunshine, another excellent sci-fi film later on this list. Tarantino cites this film as one of his major influences, and it's easy to see why. The rapid-fire dialogue is intense and creates very unique characters. Cary Grant stars as a humorous and witty newspaper editor, but Rosalind Russell steals the show with her fiery performance as a talented reporter and writer caught between her inescapable love and drive for a journalistic story and her desire to marry and settle down. This film stands out amongst the numerous space movies of the last few decades by providing an interesting glimpse into the psychological turmoil that a crew would experience. Set in the near future, the story follows an international team of astronauts who try to reignite the dying Sun before Earth completely freezes over. The visuals are awe-inspiring. The sheer scale of the universe and the infinitesimal nature of humanity is a strong prevailing theme, as are questions of life, death, and the afterlife. Danny Boyle is an incredibly dynamic director who got my heart pounding and my mind churning over the movie for days afterward. Danny Boyle proves with this film why he's my favorite director. You can be assured that his films will never be boring, rote, or formulaic. He's not afraid to make bold choices—and sometimes they can be divisive (as in Sunshine). This movie pairs Boyle's talents with Aaron Sorkin, acclaimed writer of The Social Network, another film about a flawed tech genius. The screenplay assumes a bold 3-act structure that instead of following the typical cradle-to-grave biopic formula focuses in on 3 key events in Steve Jobs' life to give us a more subjective, personal take on who he was as a person. The film was dynamic, engaging, emotional, and thoughtful. The use of different shooting formats to denote time (16mm, 35mm, and digital) worked superbly well. The editing was also extremely memorable (in a good way). I would also recommend reading the biography by Walter Isaacson (which the script is based on) because there are numerous clever small references throughout the film. This is one of the most visually striking films I've ever seen. Director Guillermo Del Toro makes great use of animatronics, makeup, sets, and visual effects to wholly immerse the viewer in an imaginative world. There are two parallel stories taking place in the film, and the way they interweave and affect each other is very interesting. The writing utilizes heavy symbolism and will keep you thinking about it for a long time. I didn't know much about the fascist Falangist regime in Spain during the 1940s, and this film inspired me to learn more about it. This film is both fantastical and filled with gritty realism, and perhaps the most interesting question it ponders is deciphering what sort of world we live in. This was one of the most surprising films that I watched this year, perhaps due to my very low expectations I held after being disappointed by most of Pixar's recent efforts. I think this is one of, if not the very best of Pixar's impressive filmography. The characters (despite only representing a singular emotion) are surprisingly vibrant and endearing. A sign of great writing is being able to take very complex ideas and concepts, such as how our emotions and memories work, and presenting them in a very simple, clear manner. Inside Out succeeds here, and indeed feels revelatory. Laura is a classic murder mystery with several clever plot twists and surprises. The charismatic cast of characters kept me vacillating between guesses of who did it. Go in blind and enjoy the ride. This film is an intriguing bridge between Peter Jackson's early splatter-horror-comedies such as Bad Taste and the grounded fantasy epic Lord of the Rings trilogy. It tells the true story of two girls who develop an obsessive relationship who, after separated by concern from their parents, plot revenge. Set in breathtaking New Zealand, Jackson shows hints of what was to come with fantasy sequences involving miniatures, clay models, and sets. This film is intense, distrubing, and powerful: giving fair treatment to all those involved in this famous horrific tale. Considered by many to be Hitchcock's masterpiece, Vertigo is an intriguing story that ultimately left a sour taste in my mouth due to Hitchcock's lack of compassion shown to the protagonist by film's end. Despite this, I consider the film a must-watch, as the writing, cinematography, and famous dream sequence elevate the film and continue to be an inspiration for filmmakers nearly six decades later. The dramatic twist is a true surprise that reframes the entire narrative and causes one to reevaluate the characters and their motives. The cinematography, art direction, and visual effects made this a treat to watch. The film is extremely poetic, with many scenes and plot points carrying symbolic value. It felt like an old storybook, complete with fantasy elements and tales of love, danger, betrayal, and escape. The choreography is beautiful—simultaneously conveying a fight and a dance. Feast your eyes on this exquisitely colorful film. I thoroughly enjoy stories told through unreliable narrators. Although this film's protagonist and narrator seems reliable, it is rather shocking when the film opens up on his death. From there the film careens on a course headed for the inevitable tragedy yet somehow entices the viewer into hoping things end differently. The film explores a longing for the days of youth gone by, fleeting fame and the struggling artist. I think the story holds extra significance to those working in the industry. Swingers is a great movie about getting over someone after a tough breakup. It captures the nonsensical agony, the struggle of reentering the dating pool, and dealing with bouts of depression. Jon Favreau's script is very funny and extremely relatable and Vince Vaughn gives one of his best performances. The title is a brilliant misdirection that reveals itself in the surprise ending. This film focuses on an ambitious immigrant businessman played by Oscar Isaac who struggles to defend his company and family in the most dangerous year of New York City's history. Layers of intrigue follow as he is under investigation and his workers beg for protection, yet he is completely averse to all forms of violence. The film showcases wonderful performances and examines the unfortunate and often unexpected consequences of doing the right thing. I have never been so blown away by a movie before. Room is absolutely best seen going in knowing as little as possible. Every aspect came together: the writing, acting, score, and directing are all fantastic. I still think about it often; I cried many times. Scene after wonderful scene struck me in a way I had never felt before and sometimes brought up emotions long buried. It was utterly visceral, moving, disturbing, beautiful, and ultimately hopeful. It never shied away from reality or became saccharine. The characters are incredibly real: Brie Larson and Jacob Tremblay were phenomenal. This is the kind of film that makes me want to do this with the rest of my life. In my opinion, Room is the best movie of the year, and certainly one of the best films of the decade. Spotlight tells the true story of how a small group of reporters at the Boston Globe uncovered the massive scandal of child molestation and cover-up within the local Catholic Archdiocese, alerting the world to the global nature of the issue within the Catholic Church. While competently directed and shot, the screenplay masterfully unveils the story and then causes the viewer to ponder their own responsibility and wrestle between what is right and wrong. Mark Ruffalo delivers a stirring, emotional performance that will have you question your own faith and convictions. The difficult subject matter was handled supremely well and the film was especially emotional for me, as I have recently made a film called The Hideout which also deals with child sexual abuse. I didn't know very much about The Beach Boys apart from a hit song or two. This unusual and memorable biopic takes us through glimpses of lead Beach Boy creative Brian Wilson's journey as he struggles with emerging psychosis, depression, and eventual captivity by an unethical and abusive psychiatrist. The use of music and sound design is stellar, and both Paul Dano and John Cusack are excellent as Wilson. I have never had as dramatic a reversal of opinion on a film as I have with Mulholland Drive. Please don't give up after the first quarter of the movie like I almost did. David Lynch explores dream theory and comments on the common goal of "making it in Hollywood." The film is exceedingly artful, utilizing confusion and then shocking clarity to maximum effect. This is another film you'll be pondering for days and rewards repeated viewing. The clever, consistently funny script by Nora Ephron maximizes memorable situations and turns them into scenes depicting the human struggle for love and companionship. I think this is one of the best romantic comedies of all time. It somehow avoids common clichés and tropes of the genre, and provides unique characters whom we can easily relate to. The Lobster is one of the most unique films I've seen. It is set in the imagined near future, where singleness is outlawed. Once one becomes of age or is made single through death or divorce, they are brought to The Hotel. Here they are given 45 days in which they must find a romantic partner or be transformed into an animal of their choosing. A philosophical sci-fi that is similar in tone to Ex Machina. The classic open-ended finale will frustrate some audiences, but I absolutely loved this film. This was a visual feast. My favorite aspect of the film was that it showed me a wholly unique world I'd never seen before. Art direction, character design, and all of the practical and visual effects were stellar. I was very pleased with the pacing. It was hectic but the moments to breathe were definitely there. Cinematography was really interesting: a LOT of time remapping and some unique night for day shots that helped convey the different world. Color correction was very heavy handed but I think it played into the visual aesthetic. The story was incredibly simple and rather predictable. The themes were repeated multiple times throughout, but I think it worked and I'm not sure much more was needed. The film was tight, with no filler and I very much appreciate that. A pinnacle of the action genre. I am a big fan of films that deal with currently relevant topics and present them in both an entertaining and informative manner. The Big Short definitely falls into this category, depicting a small handful of financial outsiders who predicted the economic collapse of the mid 2000s and bet against the big banks who were blinded by greed. The star studded ensemble cast is a highlight, and the humor is refreshing. For such a dismal and anger inducing topic, the film's tone is masterfully balanced between humor and indignation. I just wrapped a 2 week shoot with Digital Paradigm where I was the Director of Photography on a promotional series for the Skin Cancer and Cosmetic Dermatology Center. As with every project I take on, the choice of camera is very important. After weighing the options and constraining factors, I decided that the Blackmagic URSA 4K was the best camera for our budget. Having used the original Blackmagic Cinema Camera two years prior, I was excited to see how the company had improved their offerings. Blackmagic claims 12 stops for the URSA 4K (15 stops on their new 4.6K sensor) and I was pleased with the results. I was able to use the natural light from a large window as background/ambient fill for my interview setup without blowing it out. Having the RAW image data is a life saver when it comes to color temperature, which can be exceedingly difficult to manage in corporate office environments where less than flattering fluorescent light is the norm. Having the additional room in post to preserve skin tones was a big plus. I acknowledge that this point is very subjective. To me, the images the URSA produced felt very organic—as opposed to the sterile, harshly digital feel of some other cameras. I was especially pleased with the way that the URSA handled skin tones and mixed color temperatures. The URSA does up to 80fps, which was plenty for my desired subtle use. If you're looking for stop-in-your-tracks slowmotion, you'll need to look at other camera solutions. Because of my limited lens options and that the final product would be in 1080p, having the additional resolution for cropping possibilities was an added benefit. This was a major concern with Blackmagic's earlier cameras. With the URSA, the company seems to have put a lot of thought into ergonomics and usability, especially right out of the box. Because of the money saved on the camera choice, I was able to invest in more lighting and a better lens package, as well as adding the Blackmagic Pocket Cinema Camera as a B Cam. After using the camera for two weeks, I was really able to appreciate how nicely each aspect of The URSA is designed and laid out. The first thing you'll notice are the 3 fairly large screens. The main display (coming in at 10.1") has been mockingly referred to as "a tacked on iPad." However, I think this is a situation where you can't knock it till you try it. I loved being able to view my shots at that size and in full 1080p. It also felt much more immersive while operating than a typical 5" display. Unfortunately, the screen alone is not bright enough for harsh, direct sunlit conditions and you will need to plan accordingly. The two smaller (touchscreen) displays can cycle through showing the settings menu, a recording info display, or a monitor feed. This can eliminate the need for an additional monitor, and having one on the dumb side of the camera allows for an AC to make quick adjustments, determine focus, or even allow the boom op to quickly check the shot framing. The layout of the recording info display is one of my favorite aspects of the URSA. Cleanly laid out is a large timecode that is easily read at a glance (for example, by an interviewer gauging how much time has passed), a large histogram, audio levels, recording format information (roll, color temperature, fps, shutter angle, compression rate, resolution), and my favorite: two bar graphs depicting each CFast card and the clips they contain, with remaining space at the end. It's a lot of info for one screen and yet it tells you exactly what you need to know with just a glance. Simple, smart design. The top of the camera is full of screw holes allowing for several further accessories. I gladly adjusted the top handle to optimal position. All of the ports are easily accessible and don't get in the way when operating the camera or with several cables hooked up. The ease with which I connected a feed for video village or AC power seems so simple it should be a given, but when compared with other cameras (I'm looking at you RED), the URSA shines in this department. When we had to use on-board audio (more on that later), the two large VU meters made monitoring levels a breeze and the physical adjustment knobs were another nice surprise. As I mentioned earlier, skin tone reproduction, good color science, and high dynamic range were important for me and I think the URSA delivered great results. Image quality can be subjective, but the natural, vibrant colors and clean skin tones really made me happy. I won't delve in to the camera's tech specs, but the global shutter and native ISO 400 are two aspects that should be addressed. The global shutter is lovely—no jellocam, movements felt much more fluid, etc. The native ISO 400 took a little getting used to, as many cameras today are native ISO 800. Just meter your scene and make sure you're using enough light and you'll be fine. Even if you have to push the image a bit as a result, I found the digital noise or "grain" structure from the URSA to be quite pleasing—no bright harsh pixels or busy noise here. The images below are straight out of camera with the standard REC709 LUT applied—no other adjustments. This is a frame grab from our interview setup. To light the shot I used two KinoFlo Diva Lites in tandem as the key light, a scrimmed 150W ARRI Fresnel as fill, a 350W ARRI Fresnel for backlight, and the window served as a background light. At one point during the shoot, we were about to record an interview only to realize that our Zoom H6 Audio Recorder was out with the B-unit. Taking a plunge into the unknown, we ran audio through the URSA's built in inputs. The full size XLR ports were great (no need for an adapter as with many other cameras) and as I mentioned earlier, the large VU meters are both pretty and functional. While the URSA preamps weren't as strong as the H6's, (I would say they were about 3/4 as loud), they were surprisingly noise-free. So, if you're looking to go single system sound, the URSA is a good option but I still prefer using an external recorder. The Carl Zeiss CZ.2 28-80mm T2.9 was my primary lens for the shoot. When working on commercial projects I've found that having a zoom lens allows me to adapt to the often run-and-gun style required by these environments. We got one of the new Anton Bauer batteries (along with several older ones), and we all strongly disliked the new design. It's bulkier, has an odd shape, and had a smaller capacity than the old ones. I was pleasantly surprised by the Redrock Micro matte box and it's swing away design. I also appreciated that the filter trays accommodated multiple filter sizes. For lighting I used two KinoFlo Diva Lites, and an ARRI field kit containing a 650W, 350W, and 150W fresnel light. For camera support we used a Manfrotto tripod and a Dana Dolly as well as the ocassional handheld shot. This camera is heavy. I mean surprisingly heavy. Body only, it weighs 16.5 pounds, but once we added the lens and everything else the camera ended up weighing just over 30 pounds. As wonderfully fast and spacious as CFast cards are, they aren't exactly cheap yet. We used two Lexar Professional 256GB 3400x cards which are nearly $700 each. Thankfully, the industry seems to be embracing them, so we should be seeing some price drops soon. Also, not all CFast cards will work with the URSA, so be sure to check Blackmagic's list of approved cards beforehand. Also, please be aware of serious issues when formatting your card using HFS+. You should format using exFAT if you want to avoid data loss. Thankfully, I discovered this early on in tests but I wish Blackmagic were more forthcoming about it. Better yet, they should remove the HFS+ formatting option entirely until they've resolved the issue. Shooting RAW comes at a cost. It takes up a lot of space! Thankfully, the URSA provides a slight compression option (3:1 ratio) but that's better than no compression at all—which is what you're stuck with if you choose an older Blackmagic camera. The URSA is manufactured by Blackmagic Design, and they have generously bundled it with the full version of their renowned DaVinci Resolve software. This allows for a wonderful color correction workflow. However, be advised that the 3:1 RAW compression setting is proprietary, meaning that the files are only readable using DaVinci Resolve. In order to bring the footage in to your NLE of choice, you need to first create proxies. This can take several hours, so be sure to anticipate the additional time. If you choose to shoot in Uncompressed RAW or ProRes HQ (as we did with our B Cam) then those files are ready to go for the edit. The Blackmagic URSA is a great choice for many projects and is a major improvement over Blackmagic's earlier offerings. I hope you found this review helpful. If you have any other questions please leave a comment below! A big thank you to Niki Penola for the beautiful on-set photography. 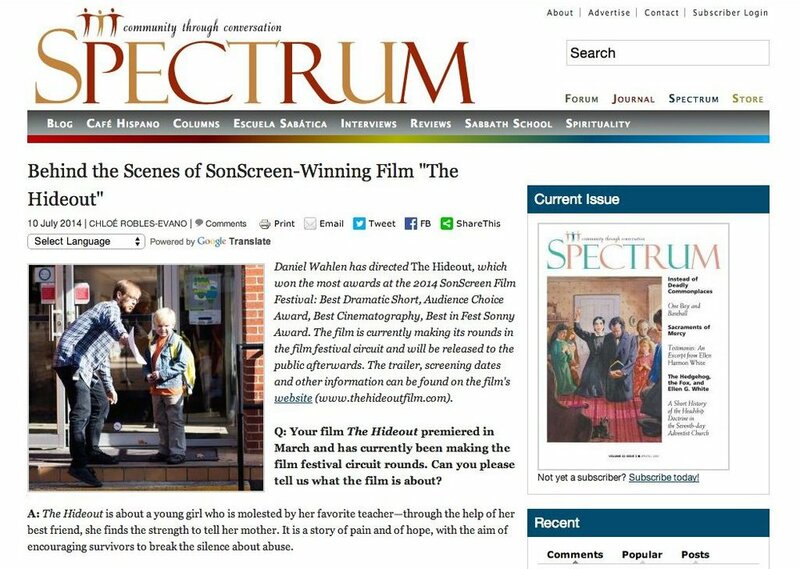 I had the honor of being interviewed for a featured article in Spectrum Magazine about The Hideout. I talked about my favorite part of making the film, went in to detail on our casting process, and told how we miraculously came across the critical location of the treehouse. Q: The subject matter of this film is pretty heavy. What made you decide to broach the issue of sexual abuse? A: I woke up one day to find out that not only was my grandfather a convicted child molester, but he had abused several of my close friends as well. A whirlwind of emotions sought to consume me, and looking for an outlet, I created The Hideout. It was a way to process the shock. Working closely with victims of abuse and their families, I sought to craft a film that was both unsettling and hopeful, authentic and bold. In every screening of The Hideout so far, a survivor has approached me afterwards with their story; it’s incredible really. This is why I got into film, and I hope to continue to make a difference. Click here if you would like to read the rest of the interview. It was around New Years time, and I was working as a DP on a gig in Orlando, Florida with my friend Niki Penola. Our friendship initially began when we were in the same lighting class (I always envied her photography skills) and grew when we discovered a wonderfully similar taste in music. On this particular day we were driving to set when she played a song. It took only a few seconds before I asked, “Who is this? They’re really good!” She informed me that they were called Rigoletto, a local band from Chattanooga where we were both attending school. A few days later my friend Ben Chase, who directed Missing Faces (the first short film I produced) called me up. We had continued working together since then, making films and hip hop music videos—but there was one thing we always wanted to do and hadn’t yet: a rock music video. "Hey man, I’ve got a project I want you to shoot for me; It’s a music video for a band called Rigoletto.” I had just gone from randomly hearing one of their songs to prepping to shoot their latest music video. The first time I heard the song I played it on repeat—getting lost in the dreamy aura and explosive chorus. This was going to be big. I started brainstorming shots and eagerly worked with Ben on unifying our approach; eventually we condensed our approach down to two words: elegant and surreal. The first thing I noticed when I met the bandmates was just how well they work as a unit. Each member brought something unique to the discussion in their approach and consideration of different aspects of the video and what they were going for. Good collaboration is invaluable. The band came up with the objects smashing and models concept, Ben refined it, and I proposed the slo-mo performance to add to the overall dream-like feel of the video. Two aspects of the production were very new to me. First, we had the band play the song at 2x speed so we shot all the performance stuff at a 48fps. When the footage was brought down into a 24fps timeline, we were able to achieve the slow-mo effect with the performance being in sync. I was very happy with how well this worked—many people haven’t noticed it on a first-time watch. The other thing was an attempt at water-reflected lighting. Looking back, it is a bit more subtle than I would have liked, and so in the future I may try a larger basin or perhaps some gels instead. I also discovered how noisy RED slo-mo footage can be. Many of the shots we took were at 300fps, causing the camera to punch in to 2K. This increased the noise in the image; thankfully most of this was able to be smoothed over using the FilmConvert plugin. Any good project has a good crew behind it and I couldn't have been happier to work with such wonderful and talented people. Also, the connection with Niki has come full circle now because she was the behind-the-scenes photographer on set that day and kindly provided the photos in this blog post. Be sure to check out her website! I grew up reading Alternative Press magazine, and so when I found out that they would be featuring the premiere of the music video on their website, I was very excited. The reception has been good so far, with an especially glowing write-up featured at Nooga.com.